My True Nature : At My True Nature™, we believe that childhood is sacred. We spend every second thinking about how to make everyday activities for kids safe and fun. Our first task was to figure out how to make kids laugh in the bath. I have said this before, And I will say it again. I LOVE small company's product packaging! 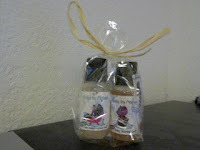 They always package their products in cute little bows, and strings, and charms and all that adorble stuff! Don't get me wrong. I still love bigger companys, But there's something about small company charm that put's a smile on my face. 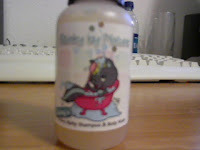 I was sent 2 bottles of My True Nature's product's i recived Daisy the skunk's Stinky by nature's 2-in-1 baby shampoo & body wash and Bobo's Bubbly by nature's Baby bubble bath. I was seriously hoping i would get both Daisy and Bobo's products. Soon as i seen them on the website i fell in love with them both. The characters are so adorable! Your kids will love them to! 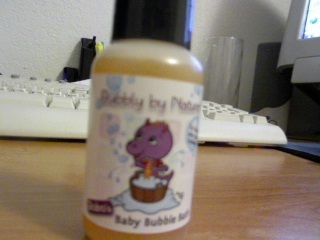 I decided i wanted to try them both as a body wash insted of a 2-in-one and a bubble bath. I would have used the bubble bath in one use. Because i really like a bubbly bath! And i would have used this bottle in one use. But i wanted to get many uses out of it. So I used Daisy's 2-in-one on my (Left) Arm, and Bobo's bubble bath on my (Right) Arm while showering. I first opened Bobo's baby bubble bath, And i took a sniff. The product smelled to me like a slightly spiced ginger. Which smelled nice because i like exotic smells. Then i opened Daisy's 2-in-1 and the sweet smell of spiced orange blossom swooned me. I loved Daisy's sent very much! Daisy's 2-in-1 left a slight sent on my left arm after showering and being air dried. While Bobo's didn't leave a sent behinde at all. Both products left me a little dry. But it's nothing that a little body lotion won't cure. Since i always lather up before bed anyways. ♥ I receive no monetary compensation for this review. I was provided baby bath products to try and give my honest opinion.